Sitting through Central Intelligence is a uniquely frustrating experience. Most movies make their share of blunders, some subjective, others less so; most movies could be better, even the very good ones, but very few actually manage to be perfect. Central Intelligence falls on the other side of that philosophical fence: There is no world in which the film’s shocking abundance of lapses in writing and direction help elevate it as entertainment. Let’s go with a food metaphor and describe Central Intelligence as an inadequately trimmed beef brisket, layered in excess fat that never fully renders and winds up ruining everyone’s Rosh Hashanah. Or maybe that’s a tad far. Central Intelligence won’t take you to cinema’s unexplored comic heights, but it won’t spoil your evening, either. It might even make you smile. That’s thanks in part to the film’s gentle inner sweetness, but credit mostly goes to its leading man team of Dwayne Johnson and Kevin Hart. Johnson is a bona fide movie star who tends to make the movies he’s in better just by being there; Hart is a funnyman who, after parlaying his success as a stand-up into a career on the big screen, has yet to find a picture that doesn’t let down his talents as a comedic actor. He probably consoles himself with the routinely strong box office his movies so often enjoy, but wouldn’t it be nice to see him do his thing in a funny, well-made movie with a funny, well-written script? Johnson plays Bob, a CIA agent out to foil a terrorist scheme and clear his name after being framed for killing his partner. Back in the day, Bob was an overweight kid subjected to torment by jerks, culminating in a prank that left him naked and humiliated in front of his peers during a school assembly. Hart plays Calvin, Bob’s former classmate and once upon a time in high school the king of all he surveyed. At that fateful assembly, Calvin gave poor Bob the letterman jacket off his back in a moment of pure compassion. Twenty years later, Calvin works an unfulfilling job at an accounting firm while Bob, now ripped beyond measure, hero-worships Calvin from afar. When their 20th reunion comes around, Bob finally has an excuse to thank Calvin for his kindness, and also to rope him into the film’s espionage plot. Just for posterity’s sake, let it be known that the plot is superfluous. You don’t need to guess who is backstabbing whom, who is trustworthy, who isn’t, and all else in between: You already know. 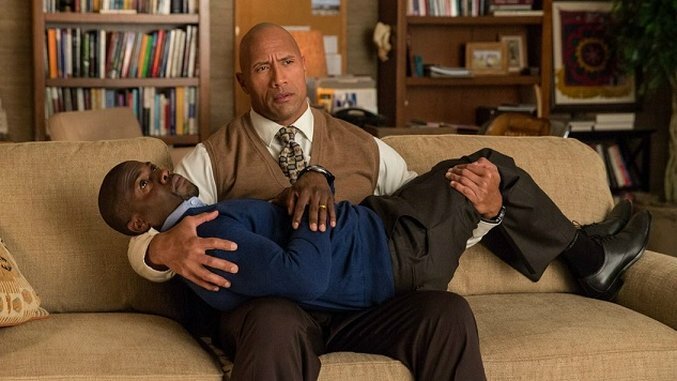 Central Intelligence doesn’t demand heavy legwork from its audience. It barely demands any, in fact, and as a result it is much more interesting when it’s about two guys bonding as adults over an incident from their youths than when it’s about spycraft, but maybe that’s to be expected. Hart and Johnson both have a real gift for effortlessly grooving with other performers, so giving them a stage to groove on naturally lends itself to easy viewing. Whenever Central Intelligence tries to be an action flick, it’s still engaging enough, but the film neither knows what the hell it’s talking about nor strikes the right balance of self-seriousness and silliness. It’s a dumb movie that’s too proud to admit it, and too straightlaced to be as absurd as it ought to be. If only the rest of the movie was better. Central Intelligence is light on laughs and lighter on know-how; its humor and style are both hopelessly stuck somewhere between the late ’90s and the mid 2000s, and in either era the jokes are too referential for their own good. (When Calvin calls Bob “Hercules” after that bar fight, cup your hands over your eyes lest they roll out of your head.) But its unfailing warmth and anti-bullying message are infectious, and good work by Johnson and Hart helps keep the film afloat even at its most scatterbrained. Central Intelligence won’t have you rolling in the aisle, but it might remind you just how easy it is to be a decent person. Boston-based critic Andy Crump has been writing about film online since 2009, and has been contributing to Paste Magazine since 2013. He also writes for Movie Mezzanine and Birth. Movies. Death., and is a member of the Online Film Critics Society and the Boston Online Film Critics Association. You can follow him on Twitter and find his collected writing at his personal blog. He is composed of roughly 65% craft beer.